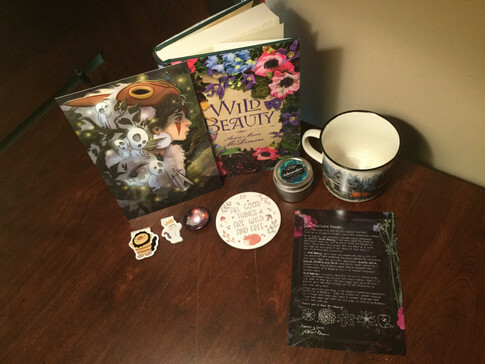 This month's Owlcrate box, Find Me in the Forest, was a pretty good one! To start we have two Where the Wild Things Are magnetic bookmarks which are adorable! Next is a Harry Potter inspired mug which has Hagrid's Hut, the Forbidden Forest, a unicorn, and more on it! To drink in that mug we have a Sherwood Forest Earl Grey and Blueberry Tea from Riddle's Tea Shoppe and Curiosities, and to go with both of them is a cute coaster that says "All Good Things Are Wild and Free". Up next is a candle from In the Wick of Time in the scent of Cabeswater. This is from one of my favorite series, the Raven Cycle, and it smells amazing! Lastly, we have a Princess Mononoke print, which I haven't watched yet, but definitely want to. Finally, we have the book, which is Wild Beauty by Anna Marie McLemore, which comes with a signed bookplate, a letter from the author, a packet of Forget-Me-Not seeds, and the pin of the month.